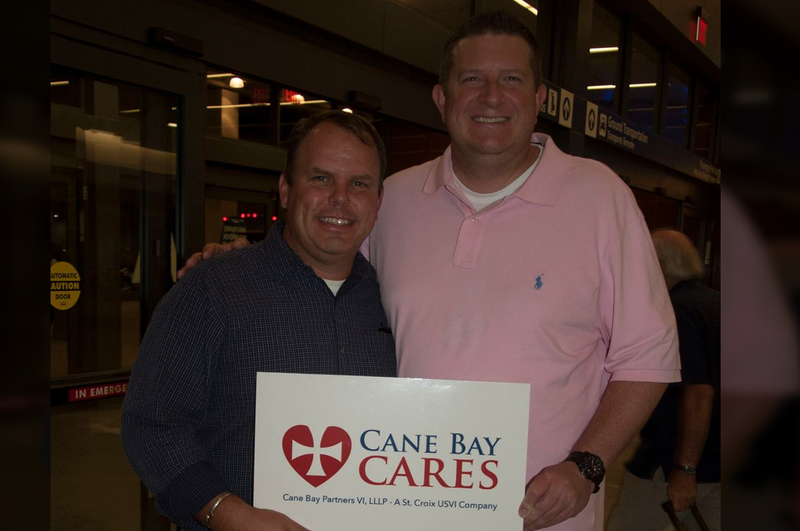 CANE BAY CARES: Cane Bay Partners Founders David Johnson and Kirk Chewning. CHRISTIANSTED — The first phase of Operation Cane Bay Cares St. Croix Hurricane Relief Drive has kicked off successfully with 36 community groups receiving a generator and thousands of residents receiving water bottles between Oct. 11 and Oct. 22th, announced Cane Bay Partners VI, LLLP Co-Founders David Johnson and Kirk Chewning. More than 90 percent of the island is still without power and there is no convenient access to clean drinking water more than a month after two Category 5 hurricanes – Irma and Maria – hit St. Croix. The first phase of Operation Cane Bay Cares focused on immediate needs – powering up and hydrating as many people and groups as possible. In the next phase of relief, items like tarps, solar lights, mosquito repellent and other specialty items that are hard to find on the island will be distributed. The generators were distributed to organizations like My Brothers Table, St. Croix Animal Shelter, Boys and Girls Club Christiansted, Boys and Girls Club Frederiksted, Women’s Coalition, Project Promise, Southgate Baptist Church, Speak the Word Ministries, Holy Cross Catholic Church/ School, Seventh Day Adventist School, Zion Academy and many others. Some of these same organizations then set up as water distribution points for additional aid shipped in by Cane Bay Cares. Between Thursday, Oct. 19 and Saturday, Oct. 22, 750 cases of water, 18,000 bottles in total, were distributed through My Brothers Table, the Boys and Girls Club, Zion Christian Academy and Foundation Ministries. All items were shipped through VI Cargo with logistics being handled by Kirk Chewning and David Johnson, as well as Cane Bay Partners employee Kyle Lajoie and other volunteers. Cane Bay Cares is trying to raise $1 million for direct relief aid to St. Croix. In the short-term, the goal is to raise an initial $200,000 to trigger a matching donation by founders Kirk and Dave. There are a variety of campaigns going on to raise funds, including a campaign to purchase LUCI solar lights, one to purchase thousands of mosquito repellant bands for children, and a Race to Recovery athlete sponsorship drive to garner 1,000 $20 donations. “We’re asking for everyone’s help here. Too often, the Virgin Islands is ignored due to its size and distance from the mainland U.S. – but the fact is, the territory was hit with two major Category 5 hurricanes and people are suffering. No amount is too small, $20 to $1,000 and up are needed immediately. Even liking and sharing our Facebook posts goes a long way,” said Kirk Chewning, co-founder of Cane Bay Partners. About Cane Bay Cares: A service initiative of St. Croix-based Cane Bay Partners VI, LLLP. 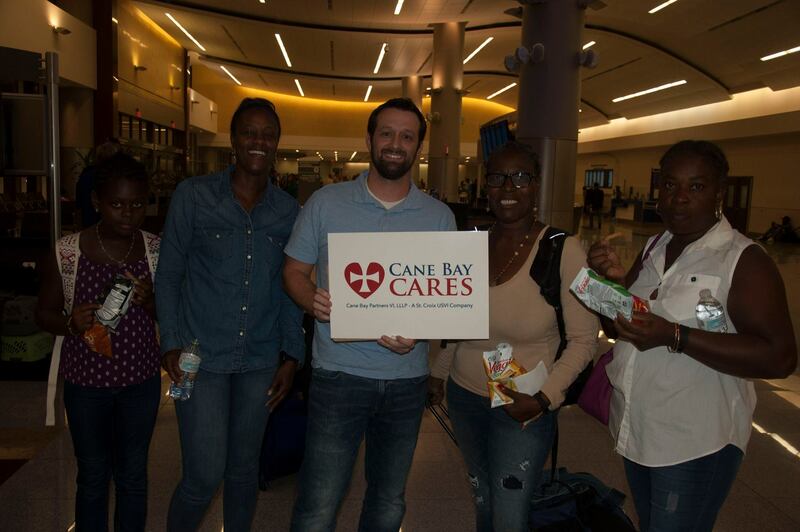 Cane Bay Cares was established after three strong hurricanes, including two Category 5 storms, Irma and Marie, caused much damage to St. Croix during September 2017. The initiative has a goal of providing relief to Cane Bay Partners VI employees and the citizens of St. Croix. To make this possible, we have partnered with Community Foundation of the Virgin Islands, which is a 501c3 nonprofit that was established in 1990. All donations to Cane Bay Cares are donations to CFVI and are 100% tax deductible. About Cane Bay Partners VI, LLLP: Cane Bay Partners VI, LLLP was formed in June 2009 and founded by internationally experienced business executives with many years of experience in the financial services industry. Focusing our efforts primarily in the financial services industry, our management consulting practice specializes in providing services to clients in need of sophisticated risk management models, debt collections organizations which require liquidation models and analytics, and portfolio management companies desiring a variety of services. About Community Foundation Of The Virgin Islands: CFVI was created to serve both donors and nonprofit organizations of the Virgin Islands that want to ensure the highest quality of life for present and future generations. Its primary goal is to build a collection of permanent funds which will be used to enhance the educational, physical, social, cultural and environmental well-being of the children, youth, and families of the Virgin Islands.